Question: Can I have astigmatism in both eyes? Answer: Astigmatism almost always occurs in both eyes. The condition can occur in only one eye but usually is the result of a physical injury. Astigmatism is a fancy word that is used to describe a malfunction of the way vision works. Astigmatism is a disorder of the eyes that can cause light to focus on two points instead of just one. This condition can be the result of a misshapen cornea. An astigmatism causes people to have blurry, slanted or distorted vision. It is a vision disorder in which the eye focuses light on the retina at two points instead of just one. People with astigmatism sometimes complain of blurred, distorted or slanted vision. Astigmatism almost always occurs in both eyes and is usually quite symmetrical between the two. Astigmatism in large amounts is often inherited. Astigmatism can occur in one eye but this is most often due to a traumatic injury. Astigmatism is sometimes caused by an irregularly shaped cornea, the clear dome like structure on the front part of the eye. The cornea may have areas that are flatter or steeper than others, resulting in distorted vision. The crystalline lens inside the eye may also be tilted slightly, causing astigmatism. In addition, astigmatism can be caused by an irregular eyelid or heavy tissue pressing down on the eye. Astigmatism is very common and usually treated or corrected by wearing glasses or contact lenses. Refractive surgery such as LASIK or astigmatic keratectomy can also be helpful in treating astigmatism. 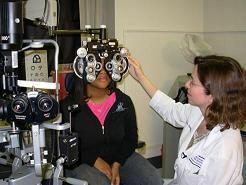 Your eye doctor may diagnose astigmatism by conducting a variety of tests. Some of the tests used to diagnose astigmatism include a simple vision test, light refraction test, cornea measurement, or electronically mapping the surface of the eye. Astigmatism is corrected by focusing light rays on a single plane. This can be accomplished by prescribing eye glasses or contacts, or be performing astigmatic keratotomy. Eskridge, J Boyd, Amos, John and Bartlett, Jimmy D. Clinical Procedures in Optometry. Copyright 1991, J.B. Lippincott Company.